The fifth edition of the habba is the most talked about community event in the neighbourhood of ORR-Sarjapur Road. Kere Habba or Lake Festival is an annual day long conservation-focused celebration of the gorgeous Kaikondrahalli lake, planned this time on February 17. 2019. It is an amalgamation of music, theatre, fitness, art, design and fun – all talking the same idiom of ecology and environment. Some of the most prominent names in the world of conservation, ecology and science conduct pro bono sessions to raise funds to support and maintain this lake. Their sessions are jam-packed and draw huge crowds. 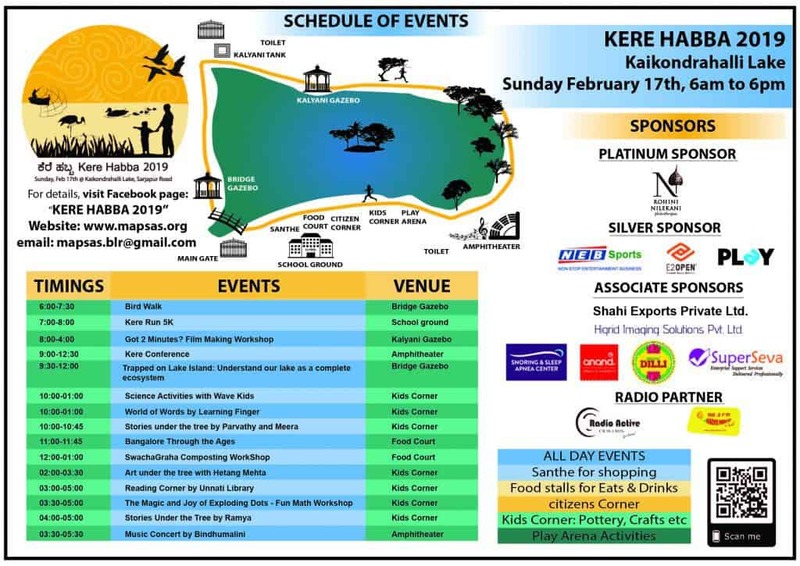 One of the key highlights of the Habba this year will be the Kere Run sponsored by NEB Sports.Kere Run 2019 will be a 5k family run around the easy and happy path of the lake and will have participation from many residents residing around the lake. This is an event to encourage people to walk out of the comfort of their homes and enjoy a walk / run around the beautiful Kaikondrahalli Lake. Visitors can look forward to a soulful and melodious rendition of Kabir’s poetry by well known singer/music composer Bindhumalini Narayanaswamy. Bindumalini trained in Carnatic and Hindustani music, but constantly explores avenues beyond the classical genres in search of the pure and soul-stirring power of music. This year, MAPSAS will conduct a path breaking conference on ‘Re-Imagining Lakes, An Innovative Approach’ as part of the Habba and during the morning session of the Habba. The conference will aim at presenting holistic and sustainable ways in which to engage with lakes. It will also aim to examine partnership models that will empower various stakeholders to become transformational entities in lake management. An eminent list of speakers as well as focus groups will each discuss the various innovative project proposals in that area. The key speakers at the conference are Dr. Veena Srinivasan (ATREE), Dr. Harini Nagendra (Azim Premji University), Rohini Nilekani (Arghyam), T B Dinesh (Janastu), B V Satish (BBMP), Priya Ramasubban (MAPSAS) with the keynote speaker being Arati Kumar Rao, National Geographic Explorer. The conference aims to get corporates, think-tanks, funding agencies, educational institutions, NGOs, CSR teams, RWAs, researchers, students and citizen groups under one roof to discuss and explore challenging and innovative lake projects and proposals. The Habba also will also witness stalls at the ‘Santhe’ as well as NGOs talking and sharing about their cause. Organic product owners and home-run businesses will promote their services and goods. Kere Habba is a green event and strives towards zero waste footprint. Water can refills with washable steel tumblers will be provided at the Habba. Visitors are requested to carry their own water bottles and shopping bags as well as waste being segregated at source at the event location. The main sponsors for the event are NEB Sports, E2Open, PLAY. Associate. Supporting Sponsors are Anand Sweets, Shahi Export House, Snoring and Sleep Apnea Centre, Higrid Imaging Solutions Pvt. Ltd., and SuperSeva. Rejuvenated in 2010. Receives a footfall of 500 visitors on a weekday and more than a 1000 on a weekend. The most bio-diverse lake in Bangalore, with local variety of trees, reptiles, butterflies, amphibians and a safe haven for several residential birds and migratory birds. 50+ species of birds have been sighted here. Cited by Niti Aayog as one of 2 model lakes in the country, for showing a successful model of lake restoration. A major attraction for runners and walkers. MAPSAS keeps alive the traditional uses of the lake such as allowing fodder for cattle, fishing and foraging. Has a strong involvement of local community. Hosts Kere Habba every year, a day long community event. MAPSAS, an acronym for “Mahadevapura Parisara Samrakshane Mattu Abhivrudhi Samiti”, is a not for profit registered Trust that was formed in 2011 to revive and rejuvenate lakes in the Bellandur ORR/Sarjapur Road/Harlur Road area. Over the past 5 years MAPSAS has successfully partnered with BBMP to revive Kaikondrahalli lake, Chikka Ambalipura Lake, Kasavanahalli Lake, and is involved with revival of Saul Kere, Dodda Ambalipura Lake, Harlur Lake and Iblur Lake. Our top priority is to encourage biodiversity in and around the lake and engage the community to play an active role protecting the lake as a thriving ecosystem. MAPSAS has demonstrated its capability to interact and coordinate with various government agencies, closely engage the local community in the maintenance of the revived lake(s), get funding support from Corporates through funding agencies like United Way and reaching out through its network of volunteers to impact the community in an environmentally sustainable manner. Through our work at MAPSAS, we hope to inspire communities in other parts of the city to also start something similar. MAPSAS will also continue to be an advisory core team to support revival of lakes plus the ‘Better Neighbourhood Project’ initiatives in the Mahadevapura, HSR Layout, Sarjapur Road, Marathahalli areas. Healthy lakes, along with their accompanying ecosystems are critical for the continuing health and vitality of Bangalore especially given the development trajectory that this city has seen in the recent past.